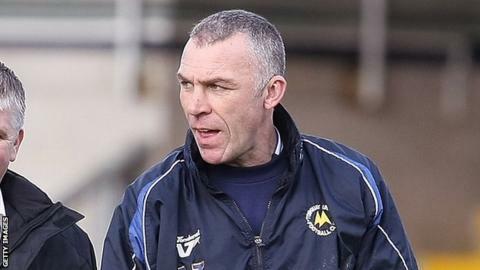 Torquay assistant manager Shaun Taylor says the club may not be able to afford to bring in any more loan signings. The Gulls brought but Taylor is unsure if there are more funds to help his struggling side. "I don't think we can budget-wise, you'll have to ask the powers that be," Taylor, told BBC Radio Devon. Benyon played the second half for Torquay, having made just three starts all season for Southend. "He's only played reserve football of late and that 45 minutes will have done him the world of good." Taylor's side conceded their first goal less than a minute after the start of the second half, and despite pulling one back in the 89th minute at 2-0 down, conceded a third almost straight from the kick-off. "It was a disappointing second-half performance," added Taylor. "We had numerous opportunities in the first half, didn't take them, and then it makes it difficult in the second half. "I'm disappointed that we've lost another game, but I'm also saying in there that we're not that far off really. "It just seems at the moment whatever's happening is happening against us. "We've got to forget about this, there's plenty of games, but we have got to get some points on that board to get us away from that bottom area where no-one wants to be."